If you are looking for information on the Native New Yorker franchise business opportunity, Native New Yorker chicken wings franchises or Native New Yorker chicken wings restaurant franchising, then you have come to the right place. For over 25 years, Native New Yorker has been serving chicken wings that will leave your mouth watering and your lips smiling. Today, with Buffalo chicken wings becoming more and more popular, Native New Yorker is still winning countless awards for it's wings, it's sauces, it's menu and it's unique concept. 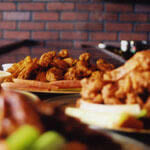 At Native New Yorker, we pride ourselves on our commitment to family, fun and food. In our sports-themed family restaurants, you enjoy a warm, inviting dining room while being surrounded by large screen TVs broadcasting every sporting event that we can find! We've created an innovative concept that's part sports bar, part dining room and fun for just about everyone! But an interesting concept isn't enough. Our franchisees receive unprecedented support and guidance as they operate their new Native New Yorker restaurants. Take a look. Comprehensive Marketing Training and Support - Knowing that marketing is the lifeblood of any business, we fortify our franchisees with detailed manuals, training videos and scripts for every marketing endeavor. From traditional marketing approaches like yellow page advertising and print ads to referral marketing and networking, we will not only show you how to do it, you'll learn how often to do it, what results to expect and what not to do. Our Pre-Training Jumpstart Program - Our Jumpstart program is one of the primary reasons our franchisees get off to as fast of a start as possible. The Jumpstart is a comprehensive pre-training correspondence course that holds your hand through every detail of your new business's start-up, from operations and marketing to setting up your corporation and obtaining a Federal Tax ID number. By doing as much as possible before training, once you've completed our initial training, you'll be ready to open the doors to your new Native New Yorker restaurant. Site Selection and Build-Out Assistance - Selecting the right site is critical to the success of your business. With Native New Yorker, we help you through every detail. From working with commercial real estate brokers and negotiating leases with property managers to choosing your contractors and complying with local building codes, Native New Yorker has a detailed site selection and build-out support system that will guide you through this very important process. An Award-Winning Menu - Our delicious, all-American menu was founded on our tasty New York-Style Buffalo Chicken Wings we introduced to the west a quarter century ago. But that's not all you have to look forward to. From our array of mouth-watering appetizers and fresh, crisp salads, to our juicy burgers and heavenly desserts, there's something for everyone. Distinctive Image and Design - Native New Yorker restaurants convey a look that is warm and inviting, with just a little bit of New York's reputed style. NNY franchises have access to a professionally produced interior design package that will set you apart from the crowd and keep the crowds in your restaurant. A Proven System - When you buy a Native New Yorker franchise, you're buying a system that has been constantly refined and improved for over 25 years. You're buying a menu that has won countless local, regional, and statewide awards. And you're buying yourself access to a staff of experts with over 150 years of collective Native New Yorker experience. These are just some of the reasons Native New Yorker is a ground-breaking franchise. We're confident you'll notice the difference. Request more information today!